The bank holiday weekend is behind us so many of our hire boats are back on the wharf. One of the boats which should have been back on Tuesday didn’t return on time. It wasn’t very well. The engine seized in the middle of Braunston tunnel as the crew were on the final leg of their cruise. As part of the handover instruction they are told how important the job of topping up the header tank is every morning. They are also told to keep an eye on the temperature gauge regularly as they cruise and to stop immediately and call the office if they notice the rise above seventy degrees. The fact that they were twenty minutes into the tunnel probably meant that they were unable to see the temperature gauge and/or the steam billowing out of the wet locker where the header tank is. The result was a broken engine at the worst possible point on their route. Fortunately, out of the eight crew on board, three were strapping males so with the aid of the boat’s pole, a bit of legging, and a mop handle, they were able to push the sixty feet long boat out of the tunnel and moor up on the towpath close to the tunnel mouth. Without going into detail (because I wouldn’t have a clue what I was talking about), it’s often possible for one of our engineers to get the engine working again relatively easily. This wasn’t one of those occasions. An engineer was with them for six hours trying increasingly complicated solutions until at 5pm he finally acknowledged that he wouldn’t be able to get the boat running in time for the crew to return to Calcutt Boats in the light. Marina owner Roger Preen and I went to see them. Roger went to make sure that the crew were as happy with the situation as possible given that they had spent the last day of their half week break standing near, and occasionally in, the Admiral Nelson half way up the Braunston flight. Roger didn’t really have any apologising to do as it was difficult to establish how the breakdown occurred and therefore whose fault it was. The problem may have been caused by the crew not topping up the header tank each morning, but we’ll never know. Roger went to mollify the crew. I had the important jobs of carrying their luggage down the flight from the boat to where Roger was waiting with his car to take some of the crew back to Calcutt. The hirers were very philosophical about the breakdown, or maybe just relieved that we didn’t question them more about their morning maintenance regime, so we bid them a fond farewell before returning to Calcutt at 7pm. The following day our foreman engineer returned to Braunston where he spent two hours identifying and fixing the problem. I was hijacked from my day’s mowing and dropped off at Braunston to bring the boat back. Every cloud has a silver lining. In this case a serious breakdown resulted in me being paid to take a boat for a two and a half hour cruise along a beautiful stretch of the Grand Union/Oxford canal. The Admiral Nelson is half way up the flight of six locks at Braunston. Our boat had been breasted up to a working boat at the top of the flight and left in the pound just below the pub so I only had two locks to negotiate. As luck would have it, two volunteer lock keepers were on duty. One helped me down through lock two. By the time I reached lock one, the other lock keeper had the lock prepared and the gate open for me and because he was psychic and knew that I hadn’t had a cup of coffee for a couple of hours, he had the kettle boiling by the time I tied the boat up inside the lock. By the time the lock had emptied, he had filled the Calcutt Boats mug I offered him with a scalding hot brew. Now that is what I call effective public relations! I managed to get stuck behind the slowest narrowboat in the world on the stretch between the bottom of the flight and the junction. I know you’re supposed to take it easy on narrowboat cruises but I’ve seen grass grow faster than this boat was moving. We inched past the masses of moored boats on this stretch, stopping for long enough by each one to join them for dinner, until we thankfully reached the junction where Mr. Slowcoach went straight ahead on the North Oxford (he should reach Hawkesbury Junction before the winter stoppages) and I turned left towards Calcutt. The cruise was a delightful hour and forty five minutes back from the junction along a mostly empty canal. At about the half way point I met a hire boat. I noticed the helmsman doing his very best cat-on-a-h0t-tin-roof impression. I saw why when he drew level with me. An irate and very swiftly moving male mute swan was stabbing at the hire boat’s rear fender with his beak and coming dangerously close to the helmsman’s ankles. I turned away and smiled to myself. I had seen this swan the previous week when I was out on my own boat. His mate had a nest in the reeds on the side of the canal. Boats were a threat to his family and savaging the rear fender was his way of dealing with it. I was still smiling to myself when the same bird nearly gave me a heart attack. The hire boat had moved far enough away from the nest to let it go. My boat, on the other hand, was moving closer to his good lady and their unborn children. Because of the distance I was away from him he couldn’t reach me by swimming, so he flew at me. I turned at the sound of furious, very close and very loud flapping to find him at head height about five feet away from me. Have you ever seen a swan in flight from that distance? It’s rather large. Fortunately he was after the fender rather than me. He tugged at it for twenty seconds before turning back to the nest. I breathed a sigh of relief and considered checking my pockets to see if I had brought a spare pare of underpants with me. At lower Shuckburgh I met Mr. Slowcoach’s brother. He was going so slowly that I actually had to take my boat out of gear to prevent myself from running into him. Both he and his good lady glanced behind frequently so clearly knew I was there but failed to make any attempt to pull over. I managed to pass them on a straight stretch, turned right at the junction for Calcutt and pulled up to set the lock. I was just opening the gate when Mr. Slowcoach chugged sedately around the corner. Seeing that the lock gate was open he steamed straight into the lock, ignored me completely, then pulled his boat over behind the closed door, then both he and his wife stood on the boat waiting for me to close the upstream gate and open the paddles at the other end. Incredible! Other than the two barely moving boats and the barmy bird, the journey was uneventful. The repaired engine performed admirably with the engine temperature deviating just two or three degrees during the trip. The following day, Thursday, I had some cleaning to do. Sally was due back after three weeks away. She doesn’t do dirt, which is always something of a challenge on a narrowboat with two dogs and a solid fuel stove. I spent a very industrious couple of hours with the vacuum cleaner, a duster and some polish. I was pleased with the end result but at the back of my mind I knew I was wasting my time. Sally can see dirt which is invisible to a normal human eye. The boat always looks absolutely spotless but I can never see the point of such intensive cleaning. After a painful two hours down to Heathrow (one lane closed at High Wycombe), one and a half hours at the airport (an hour to get through baggage reclaim) and three hours back to Calcutt (an overturned lorry, again at High Wycombe) we stepped back onto the boat in the pouring rain. Welcome back to England Sally! As expected, the following day Sally spent ten hours cleaning the boat. I’m afraid that I suggested to her near the end of her marathon cleaning session, as she took apart the desk on which I was trying to work, that her cleaning was verging on obsessive. We aren’t talking at the moment. Back to work on Saturday and the ongoing battle against grass that grows faster than it can be cut. At this time of the year with plenty of sunshine and plenty of showers, the grass grows at a phenomenal rate. The flat areas of grass around the site take about a day and a half to cut with our little ride-on mower and the whole site needs to be cut about every five days. It’s a struggle to keep up with the grounds maintenance when there are two of us at it but Pat has been on holiday for the last week and I have been dragged away from my normal activities because of two emergencies. The first was helping deal with the broken down boat. The other problem was a boat which sunk in the marina. This is the second boat which has sunk here in the last four years. As with the first boat, this one was spotted before it submerged completely but it was waterlogged enough to prevent the engine from starting so it had to be poled across the marina to where the trolley was waiting to receive it and drag it onto the slipway. Inside was a mess. The water in the cabin was about a foot deep so everything sitting on the floor was submerged. The owner is fond of carpet, lots of carpet, layers upon layers of carpet offcuts. All of it was saturated. All of it had to be taken out of the boat but the water needed removing first. A powerful pump was set up on the rear deck where it sucked dirty water out of the boat and over the side onto the slipway below. The boat had been pulled onto the slipway then raised at the front so that the water inside the cabin drained towards the rear where it could be pumped out easily. The office had phoned to owner who was going to visit the following day. He asked for any items which could be dried to be left on the boat roof and rear deck until he arrived. The boat was soon festooned with strips of carpet, bed sheets and blankets, shoes and bags. Once the pump had removed the bulk of the water, I used a wet vac to remove more and then pulled a shore line from the slipway into the boat to power a dehumidifier which we planned to use to dry out the boat while the cause of the water ingress was identified and cured. There was a powerful dehumidifier already inside the boat so, because I’m sometimes particularly stupid, I plugged it in. Once I had picked myself up off the floor I realised that the dehumidifier had been on the boat when it flooded so had been almost completely submerged until the water was pumped out. I collected a working dehumidifier from one of our workshops, turned it on and left it draining in the boat’s galley sink overnight. The problem was soon identified. There was a hole the size of a ten pence piece in the particularly thin hull of the old boat. We had surveyed the hull for the owner earlier in the year and recommended that it should be replated as soon as possible but he hadn’t yet arranged for the work to be done. The hole was patched and the boat was launched then returned to its pier still covered with ribbons of damp carpet. The owner has been on the boat now for a couple of days, drying what he can on the boat roof between heavy April showers. He’ll be able to use his boat again shortly now that we’ve repaired or replaced a number of water damaged items inside the boat. The boat still needs comprehensively replating. Whether the owner decides to have it done or not is another matter. James Ellis emailed me last week asking if I would like to add an article to the site he’s written about the perfect live aboard narrowboat. I thought it was an excellent idea, so here it is complete with my own comments. James is the owner of a narrowboat he uses for leisure cruising. He hopes to sell his boat and buy a narrowboat to live on when he retires. I have lived on board a narrowboat for four years now so I thought my own comments on the subject would be of value too. My comments are in italics. We are probably looking at a boat which is 10/6/4 construction, hopefully with a draft of no more than 22”, about 10 years old and about £50k, though we are not going to be inflexible on any of these details. Stainless tanks, a Jabsco water pump and “clever” propeller would all be valued, though a bow thruster would be considered totally unnecessary. There are certainly plenty of boats about for this price and a £50,000 budget should buy a boat which has been well looked after and which has a decent specification. I agree with James about the bow thruster. Although bow thrusters come in very handy I have seen many narrowboat owners use them almost continuously for unnecessary tasks like pushing the boat away from the side. Bow thrusters are just another piece of equipment to go wrong and another set of batteries to charge and periodically replace. Between 54ft and 59ft in length (smaller would not have enough room – longer would not navigate the whole system). Cruiser stern (we just like the space for outdoor storage, lounging and engine access). Needless to say, we would want to include as much cupboard space as possible below and above decks but without compromising air draft. 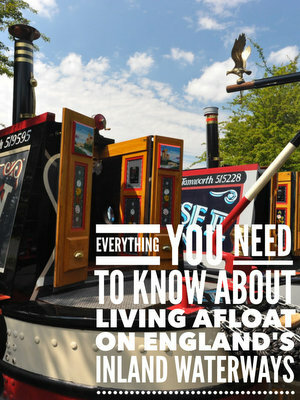 James is a 62′ long traditional stern narrowboat. I have taken both traditional and cruiser stern narrowboats on multi day cruises. I prefer traditional sterns for a number of reasons. With a traditional stern the engine is enclosed within the cabin so the space around it can be used for additional storage and for housing, in my case, an inverter, MPPT controller for the solar panels, charger, battery bank and soon to be fitted burner for the central heating system. When the central heating system is installed, I will also have a heated towel rail fitted where we can dry wet clothing but keep it separate from the rest of the boat. The engine room also houses windlasses, piling chains, mooring pins, lump hammers, recovery magnet, torches, binoculars, spare paint, varnish and brushes, waterways guides, wet weather gear, a chainsaw and protective clothing and a range of tools, some of which I know how to use. With a cruiser stern you either have to store all of this equipment inside the cabin, somewhere inside the engine bay (not really practical) or in a stern locker. However, most of the lockers I’ve seen on cruiser stern narrowboats haven’t been either secure or watertight. Another benefit of a trad stern narrowboat is that it’s a far warmer place to stand and steer on a cold day. You tend to stand inside the hatch with your lower half being warmed by the heat from the engine. On a cruiser stern you have acres of space to stand and steer, which is great is you have guests on board, but I feel divorced from the boat and quite uncomfortable. Although there isn’t much room for anyone other than the helmsman to stand at the rear of a trad stern narrowboat, there is space for a couple more people if they’re careful. They can stand on the gunnel on either side of the steerer. It’s not a perfect solution but it does work. The last benefit of a trad rather than a cruiser stern as far as I am concerned is that the cabin roof just in front of the helmsman can be used as a handy table top for the paraphernalia you tend to accumulate on a cruise. I normally end up with a waterways guide, usually Pearson’s, notebook and pen, binoculars, camera and a mug of coffee on or just inside the hatch. I’ve been very frustrated in this respect on a cruiser stern. The cabin roof is always out of reach so if anything is left on the cabin roof, reaching it requires the assistance of another person on the rear deck or letting go of the tiller to dash across the open space to fetch whatever you need. Neither of these options are practical. Cottage style, conventional layout. We like to look out from the saloon and see what is ahead. There must be space for a couple of swivel recliners (no settees as they are too uncomfortable) and a dinette which acts as dining table, chart table, office desk, knitting base station, scrabble table and spare double bed. The Pullman style of dinette makes best use of space. A U-shaped or central-corridor galley (or cross-over) would be followed aft by the bathroom and bedroom. I love James’ layout as it is. There is very little I would change about it. We have L shaped bench seating at the front of the boat next to the front bulkhead which is fitted from floor to ceiling with cupboards and shelves. In front of the seating is the stove. Just behind the lounge area is the dinette. Both lounge and dinette seating have storage built under it. I agree that bench seating isn’t as comfortable as swivel chairs but it’s comfortable enough the way Sally and I use them. We have a rectangular coal box next to the stove which just happens to be the same height as the bench seating base. We slide that across the boat and position it so that is it parallel with the long leg of the L then lay one of the seats from the dinette on it to form a “bed”. We place half a dozen cushions at the head of the bed to form a backrest and then lay on it side by side to watch television. It’s very comfortable, takes seconds to set up and allows us to keep the masses of storage under the seats. A full-size shower is preferable to a half-size bath and will be emptied by a Whale Gulper. The toilet will be pump-out, not cassette, to avoid the too-frequent journeys to sanitary stations (though a small porta-potty will be kept in reserve). There will be a really roomy bathroom cabinet. Our bathroom is walk through and is very small. It’s the width of the boat and just four feet from end to end. On one side of the corridor through the centre is the shower cubicle and on the other is the sink in a cabinet with storage under and then next to it is the Porta Potti. In an ideal world we would have a pump out toilet but we manage well enough with the cassette. Emptying the cassette is always a bit of a chore and something you want to think carefully about if you are unable to or are unwilling to lift heavy weights. Our cassette when full weights as much as a bag of coal. I leave emptying it until it’s full because I would rather make half the number of trips to the Elsan point with a heavier weight than the other way around. We have considered fitting a pump out toilet but it would mean taking apart and possibly destroying a five drawer chest on the starboard side and losing some of the storage space to accommodate the waste tank. Even if we had a pump out toilet fitted we would still want to keep a Porta Potti in reserve for emergencies so we might as well just carry on with the cassette. It’s very cramped in a 4ft bed if you’ve been used to a king-size. On a narrowboat there appear to be 4 solutions: a full-size bed forward, a cross-over bed or extendable bed aft, or two separate single beds. Given that we want to stay together but with enough space (!) and we don’t for a minute consider reverse layout, we think that a cross-over or extendable bed in the aft bedroom will be best. Our current boat has a make-up king-size in the aft cabin and that has been very acceptable. I am impressed with the hydraulic-strut storage beds displayed in some of the bedding shops and will try to engineer a similar storage solution. Beds are always a consideration on boats for the tall or amply proportioned, not that I’m suggesting for a moment that either James or his wife fall into the latter category. Our bed is four feet wide by six feet three inches long. It’s OK for us as Sally just tops five feet and I am shorter than average at five feet ten inches tall. Both of us are of slim build. Even with our slight builds I find the bed length a little constricting at times. There is a wardrobe against the end of the bed on Sally’s side so I have to make sure my feet are always on my side of the bed to prevent them from jamming against the side of the wardrobe. Once again with our boat, maximum use has been made of every inch of space. There are six drawers built into the side of the bed and more storage around the calorifier accessible by removing the mattress. with the engine to heat a calorifier, have an immersion for use with land-line attachment and, importantly, provide instant hot water for sink and shower when one, both or none of the other systems are ensuring hot water. The boat’s Torgem stove is thirty seven years old and still going strong. It has a back boiler which feeds three radiators down the boat’s starboard side. The radiators are gravity fed and don’t get very hot. The stove doesn’t do a bad job of heating the lounge, dinette and galley but is hopeless at heating anything further away. My office aft of the centre hatches is usually cold without supplementary heat, as are the bathroom and bedroom behind. At the moment we use two 500w Dimplex greenhouse heaters to warm these areas a little, which is fine if we are on a land line but unsustainable if we are using the inverter and battery bank. Next week we hope to have a new central heating system fitted which should put an end to our rear end heating problems. The heater is a Webasto Thermotop C which will be fitted in the engine room where it will draw diesel from the boat’s main fuel tank. When the heater and new radiators are fitted, the old radiators will be removed, as will the boat’s gas powered water heater. The new Webasto will provide all the hot water we need. While the fitters are busy making a mess inside the boat I might, finances permitting, ask them to take out the Torgem and fit a Morso Squirrel in its place. The Torgem is not a bad stove but it doesn’t throw out a huge amount of heat and, because it isn’t as deep as a Squirrel stove, you can’t do what many Squirrel owners do and use the top of the stove for heating food and drinks. Because we are likely to be using our boat on rivers and estuaries, we would prefer an engine of perhaps 38hp or slightly more. However, we also value economy for the times we are pottering. Is it necessary to have a larger engine to cope with good electricity generation? Whatever we do choose, I would like it to be modern, simple, mendable by this amateur mechanic, water-cooled, with good spares availability, not in a separate engine room and be well silenced. As to the make, I have had Beta recommended, I like BMC (our current engine) but they are rather long in the tooth, some people swear by Vetus and Mitsubishi sound comfortingly Japanese – the jury is still out on make. I have an unusual engine. It’s a Mercedes OM636 and like the stove it’s as old as the boat. It’s an old engine but it has plenty of life left in it yet. I believe it’s good for 20,000 hours. In the last thirty seven years it has done just 4,185 hours, an average of 113 hours a year. At the current rate it’ll last another 140 years! I think it will see me through to the end of my boating days. It wouldn’t be my first choice of engine given that it’s a little unusual so the chances of finding someone who can quickly and easily resolve any issues is that little bit more difficult. Spare parts for it are also quite expensive. I’ve just paid £140 for a new thermostat. I don’t know how much a thermostat is for a more popular engine but I’m lead to believe that this is much, much more. One of the engine’s features which isn’t ideal is that it is raw water cooled. Raw water cooling involves sucking water in from the canal to use to cool the engine. There’s an inlet on the boat’s port side which is covered with a fine mesh grill. The water then passes through a mud box where more debris is trapped. In order for the system to work the grill needs to be free of obstructions and the mud box needs emptying periodically. Both operations are difficult. I know roughly where the grill over the water inlet is on the outside of the boat but I can’t see it because of the murky canal water and it’s difficult to reach because of it’s position. If I am to reach it at all I need to make sure that the boat’s port side is against a bank or a pier and reach down with a long handled brush and scrub at the spot where I think the grill is located. The mud box is just as problematic to service. It is on the port side at the front of the engine next to the bulkhead between the engine room and the bedroom. There is quite a tight space on the port side of the engine where I can just about crouch so I can reach the bolts on top of the mud box. In an ideal world I wouldn’t have raw water cooling at all, and I would have a more modern engine which was easier to maintain. We don’t live in an ideal world though so I make do with an engine which I’m told will be reliable now that I have replaced all of the perished rubber hoses. The finer points of electricity generation, distribution and use are getting more complex as boats become more sophisticated. I don’t mind what system is installed as long as it is reliable, effective and safe. It will have to cope with a washing-machine, a lot of mains television use, electricity supply for central heating actuation (presumably), months at a time away from mains, full use in frozen winter months, a good vacuum cleaner, steam iron and hair drier, lots of small drains from chargers and laptops – and late night Scrabble! Being able to use an electric blanket for bed pre-warming in Winter would be heavenly. I am presuming that I will need at least one powerful alternator, maybe two, perhaps a separate generator system, a 500AH bank of batteries, a large (2kw?) inverter and mostly (but not all) LED lighting. Vetus seem to have an on-board integral generator which might be the solution. A battery management system seems like a good idea but I have yet to find out if it merely complicates things. With all my lights now changed to LEDs I don’t have any trouble powering as much illumination as I need. The lights draw very little power. I have a 230v television which means that I have to have the inverter turned on if I’m out cruising and I want to watch television. The inverter itself uses a fair amount of power so when this television set goes to the great big repair shop in the sky I will buy a 12v model. Using the battery bank to power an electric blanket may not be practical. Anything which heats up – hair dryer, iron, toaster, hair straighteners and electric heaters – usually use too much power for the battery bank to sustain them for very long. I have a 1600w Sterling pure sine inverter. Pure sine are better than modified sine inverters as some appliances won’t run on modified sine. Consequently the pure sine inverters are much more expensive. Our 1.6kw inverter is man enough to deal with most of the appliances which I think are important on board but not good enough for the appliances which Sally wants to use regularly. It won’t run the vacuum cleaner, iron or hair dryer. I understand that the Henry 1.2kw vacuum cleaner is a very good machine, and one which our inverter could handle, but I’m meeting a certain amount of resistance in that department. When I first moved onto James the electrics where woefully inadequate. There was a single starter battery and just one battery in the leisure bank. I immediately added another battery to the leisure bank but have since doubled that again to a total of four 135amp leisure batteries. The batteries need something to charge them of course so I had a charger fitted to keep them topped up when we are plugged in to a land line. The alternator should do that job when we are out cruising but last week I asked if the alternator’s annoying squeal could be fixed, I was told that the simplest solution would be to fit a new alternator as the existing one wasn’t actually charging the batteries anyway. That’s another job scheduled for the next couple of weeks. Another electrics addition, and one which I am very happy with indeed, is 3 x 100w solar panels and an MPPT controller fitted by Tim Davis of Onboard Solar. The solar panels provide me with nearly all the power I need in the warmer months and a worthwhile amount the rest of the year. Having a decent solar power system on board is wonderful in the summer months when you don’t want the tranquility of a remote mooring spoiled by the need to turn on the engine to charge the batteries. The final piece in the engine room electrics jigsaw was a Smartgauge battery monitor. A decent battery bank is an expensive consumable. The life of the batteries can be extended significantly if the batteries are kept as full as possible. Until recently the only time I knew the state of charge was often Sally screaming when there wasn’t enough charge in the batteries to push the water through the gas heater quickly enough which resulted in Sally being sprayed with scalding water. One hundred and fifty pounds was a very reasonable price to pay to ensure that I always know when the batteries are fully charged, and when I can expect a brief lapse in our on board domestic bliss if Sally is suffering from 1st degree burns caused by a poor battery charging regime. An important addition to the rest of the boat interior is a 230v ring main and enough sockets in the places where you need them. Of course the more sockets there are and the more appliances plugged into them the bigger the battery bank you need and the harder you need to work to keep it charged. I have to admit that Sally and I aren’t very good at minimising the electrics we use on board, but we don’t really need to at the moment when we spend most of the time plugged in to a land line. We will need to rethink the way we do that if we are out cruising most of the time. The alternative would be to have a generator fitted. Monique (Mons) McNaught has done that on her boat Pern. She is currently moored at Calcutt but is about to set off on her grand adventure around the system working as she goes. She needs sufficient power to spend full days siting in front of her computer working when she is off grid. The generator will make sure that she can always earn a crust (subject to her being able to get an internet connection). I don’t know what power she needs for the work equipment she has on board but I could certainly manage in the summer months with just the power supplied by my solar panels and the odd hour with the engine running. Personally I would rather try and use less power when off grid, by not fitting bow thrusters for example, than add more equipment to the boat so that I can use more. The washing machine has already been mentioned. A small freezer as well as a fridge would be handy (are the combined units cheaper to run?). Things like a folding (electric?) bike can be added (Oh, that there was room for a motor scooter!) as can a folding wheelbarrow. I will add a 6ft crowbar and a small spade. Some items like a microwave oven, t.v. signal booster and good torches, the usual deck equipment and a good anchor we take for granted. For estuary use we’ll need lifejackets – including one for the dog – and navigation lights plus an appropriate form of radio (I’ve yet to take the course). We are seriously considering something electronic and GPS-based to replace Nicholson’s guides as some of ours go back to 1974! Part of us says that streamed way-mark pictures and metre by metre interactive mapping give us certainty of what comes next – another part of us screams for the thrill of less certain adventure. I HATE washing machines on board! It’s an entirely subjective point of view and one which won’t be shared by many boaters. I’ve mentioned Sally’s fondness for our twin tub before, but it drives me mad. I’m sure, but I can’t prove it, that she sometimes spends hours washing and drying clothes before putting them straight back in the washing basket so she can have another go at them. Sally has just spent three weeks away from the boat. She reluctantly left me in charge of the cleaning. She’s been back on the boat for just half a day and she’s already enthusiastically renewed here acquaintance with the twin tub. I have to confess, and I hope Sally doesn’t read this, that I didn’t use it once when she was away. I saved up all the washing until yesterday then threw it all into one of the two washing machines we have on site. An hour and a half later it was all clean, two hours after that it was dry and an hour after that clean sheets were back on the bed and the rest of the clothes were put away. I’m in trouble for not ironing the bed sheets or folding up my underwear in the drawer, but there’s a line over which I’m not prepared to tread. Folding underpants is way beyond the line. Our washing machine when it’s in use is very boat friendly. It uses 120w when washing and 170w or thereabouts when spinning so the inverter can handle it easily. Whether the battery bank can stand it being used for twelve hours in a row remains to be seen. I think most suitable automatic boat washing machines can run on 1800w or less. A washing machine and the logistics of keeping it fed with sufficient power and water is something you need to consider when cruising full time. I think that if I was on my own, which I may well be if I keep harping on about Sally’s cleaning, I would make do with a fortnightly service wash at a nearby launderette. The Aylesbury Canal Society sell a comprehensive printed guide of all the launderettes on the system for just £4.50. With regard to the folding electric scooter, good news James, I know a man with a cruiser stern narrowboat who has one. He’s my recent drinking buddy Bangkok Tim. I can put you in touch with him if you like. Maybe you can offer to buy his from him and save him the embarrassment of looking like a Hell’s Angel on a pushbike. A folding bike is much more practical in my view. I have one which will fit in the engine room when we are out cruising. I haven’t yet tried cycling down the towpath with a week’s worth of groceries hanging from the little handlebars but I’m looking forward to the challenge. With regard to electronic guides, I’ve tried a few and although they aren’t bad inside the boat, in direct sunlight they are very difficult to see. I’m very happy with my Pearson’s guides. They are easy to lay flat on the rear hatch and refer to as we cruise. We want our boat to look cheerful, distinctive and practical but providing the colour is not too garish, anything will be more interesting than the Oxford-Blue-with-white-coachlines livery we currently enjoy. The boat must let in lots of light, so large windows (not little portholes) are essential. One would hope that the window units are double-glazed and aluminium or brass-framed. The roof should be a lightish colour and, like the gunwhale decks, should have a non-slip treatment. In an ideal world I would buy a new Sea Otter narrowboat and not worry about painting the boat. Their aluminium narrowboats paintwork comes with a fifteen year guarantee and, unlike the normal steel narrowboat which need covering with a good layer of paint top to bottom to keep the rust at bay, the Sea Otters don’t rust so the paintwork is purely decorative. Again, we don’t live in an ideal world so I can either consider paying roughly £100 a foot for a professional boat painter to do it (£6,200 for James) plus another arm and a leg to have the sign writing done, or I can paint it myself again like I did two years ago. This time I would try to get the coach lines to look less like an oscilloscope reading. I would consider getting the sign writing done professionally to include the site logo and the web address. As the purpose of my perfect live aboard narrowboat would be to carry Sally and I around the system while I earn a living, and as the cleaning vans I used to own picked up an incredible amount of business from the sign writing on them, adding the web address of the site from which I sell my guides for potential narrowboat owners wouldn’t do me any harm. Double glazed windows is not something I would consider on a narrowboat. I have seen, and heard of, many boats where double glazing seals have failed because of vibration or the boat’s general knocks and scrapes as it moves. I recognise that some form of double glazing on a boat can be very beneficial though so I would have aesthetically pleasing double glazing panels which could be removed quickly and easily when required. Both of us find the over-use of wood claustrophobic. Some is nice and reminds us of tradition: too much is twee, dark or fussy. (Two boats we looked at recently had such a plethora of zig-zag planking on floor, walls and ceiling that we felt we were starring in a Cuprinol advert)! In particular, we find a white ceiling reflects light well and light-coloured upper walls make a boat interior seem roomier. Below the gunwhales seems less critical – carpet seems cosy but so much of that space is likely to be covered with bookshelves and other fixed furniture that I’m not too worried either way. However, the wood that is present needs to be of light to medium hue (light oak, beech, ash). Most of this, of course, is a matter of personal taste, like the engine, hull, equipment and heating priorities. The real argument will occur when soft furnishings are decided: I like abstract, Rosie likes floral. At the end of the argument I’ll say my wife’s right and I’m wrong, as we usually are! Sorry James, but I like traditional, all wood interiors. I agree that some wood can be dark and make the boat feel claustrophobic but I love the look and feel of polished wood. My perfect live aboard narrowboat would have pretty much the same design as I have now but all the woodwork would be solid light oak. My boat has beautiful Parana pine cladding on the cabin sides from the gunnel upwards and on the roof. Sadly some of it has been stained by water ingress during the decade and a half when the boat was poorly maintained. All of the rest of the woodwork, and there is acres of it, is in teak (I think) faced ply. I don’t enjoy cleaning generally but I get a great deal of pleasure out of polishing wood to a slippery sheen. My idea of heaven would be a narrowboat filled with beautifully crafted solid oak units and enough free time to polish them. There are many lovely boats out there with lovely names. However, we have decided that rather than trying to love a name someone else has chosen, we will remove our second-hand “new” boat from the water for its modifications to the spec we want – and relaunch it as “Blissful”. Look out for us in years to come. We’ll be touring the “ideas” stands at the Crick show with renewed purpose this year. I fully intend to keep the boat I’ve got. It’s not the perfect live aboard but I have to be practical about these things. I’ll never be able to afford a boat which fits my perfect specification but the one I have now doesn’t do too badly in most areas. Will I change the name to put my own stamp on the boat? I don’t think so. The boat was well used and cared for during the first twenty years of its life so after a mid life crisis, I expect it to recover its vim and vigour for the next twenty years. I won’t change the name, but I might not display it on the sides. As I mentioned earlier, I might well seize a wonderful marketing opportunity with both hands and display the web site address where the boat’s name would normally appear.